For travel paradise, Te Anau is a very peaceful town, the city is just beside the lake. From Queenstown, we spent about 3 hours. Reached YHA accommodation was already around 7-8pm as we had stop at the road side to take a break for napping :). We stayed in Te Anau for 2 nights, the first day we reached was a raining day, and the next day we were going to Milford Sound for cruise, so we was keep praying the next day is good weather. Some of the visitors come here is because they want to go for trekking, here is the famous place for world wide trekker. As he Milford Track and the Kepler Track are probably best known, but there are many other fine walks, including the Routeburn between Glenorchy (Queenstown), and the Milford Road, and the Key Summit, from The Divide. I saw many trekkers from oversea staying in YHA and prepared for trekking for the next day, they always spend about 3-7 days for trekking, they brought many necessary for the trip. They are really "superman" as the backpack is larger than mine about 3 times!!! The scenery here is not really good as Queenstown and Wanaka, and not many shopping and restaurant. Unfortunately, my wife got flu and sick (slept at YHA for whole day) and unable accompany me for outside photography. Some more where was raining, not much scenic scenery attracted my attention. So I did not take many picture there. 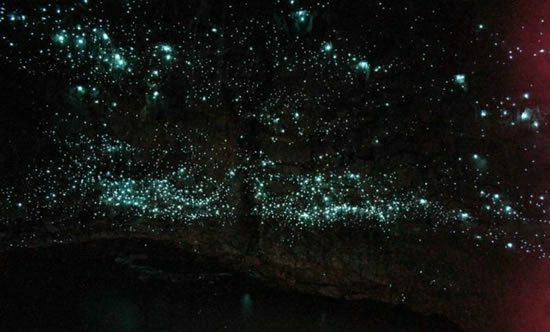 The purposes I come here, one is to visit the Glow Worm Cave, another one is to transit to Milford Sound. Glow Worm Cave is the one you can not miss out if you have never seen this insert before although the entrance ticket is not cheap. Glow worm is a special bug who is not like the firefly. I joined Realjourney for this Glowworm Caves, the service is not bad, you may visit here for details. The price had been increased. 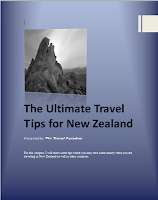 My price is NZ$67 per person in Feb 2011, but now is NZ$70 per person. Glowworm is living in the caves for long long time ago. It is a very special insects, the size can up to four centimeters long, Glowworm glow to lure small insects over, and then stick to the web and then eat it. The more hungry larvae will be morebright light! And so it becomes adult after, it will become winged insects, but it has no mouth at all, so cannot eat. They became adults, their only responsibility is mating. After the mating, glowworm will die in soon, meaning they don't eat but only mating. In the morning, we reached the reception of Realjourney and arranged us on board of cruise. Is about 45 minutes from the port to caves. After we embarking at the port, the guide will lead us to a disply center, they have set up a display/waiting center for the visitors. At there, they will start briefing and present the history of caves and glowworm for your knowledge before they send you into caves. As there is a limitation of number of person go in, is about 14 persons per lead (if not mistaken). So we have to wait at the display center. Inside the caves, the guide will guide you to walk through a small path, from there you may see some glowworm but not so surprising. After that, guide will provide a small boat which fit for 15 person and he will drive the boat into the the caves, the caves is totally "dark", you are not even see your own finger. The only thing you can see is the light from the glowworm on the caves's wall. Please dont open your mouth when you face up to see the light, as there is some drop will hit you. There are thousands of blue light "smiling" at you!! Is amazing!! The whole trip spend you about 2-3 hours. To visit glowworm caves is also depending on season, Summer is the best season for visiting glowworm as they breeding. This is one of my memorable moment when we visited this caves during my honeymoon, I would like to recommend for all the travel bloggers and visitors.